This was a great timepiece exhibition involving the photographs of some great Australians: Micky Allan, Virginia Coventry, Gerrit Fokkema, John Gollings, Tim Handfield, Ian North, Robert Rooney, and Wes Stacey. I was fairly familiar with much of this work and few surprises. All of the work had a strong presence whenever shown over the last decades. What the lovely surprise was how well the works all worked together on one exhibition. In fact I would say that the collective force of the exhibition was that it seemed to have empowered the individual works all over again. Originally when all these photos were exhibited (decades ago! ), they had a relevance to the time. They reflected when the country was very prosperous and people got in their cars and travelled around their new urban areas, and out into the country. It was the age of the road trip! THE ROAD is one of the great subjects in Australian visual culture. In many of our greatest films, books and works of art, the road is a place where personal identity is negotiated, where the national story unfolds, and where culture, technology and nature come together at times in extraordinary ways. MGA’s exhibition The road brought together a range of photographic projects that explored the road as experienced by many Australians in the 1970s and ‘80s. Presenting the work of eight prominent Australian artists, THE ROAD announces the road-trip as the quintessential Australian journey, highlighting the challenges to life and culture that accompanied suburban expansion and the ways that Australians embraced the road during the 1970s and ‘80s. 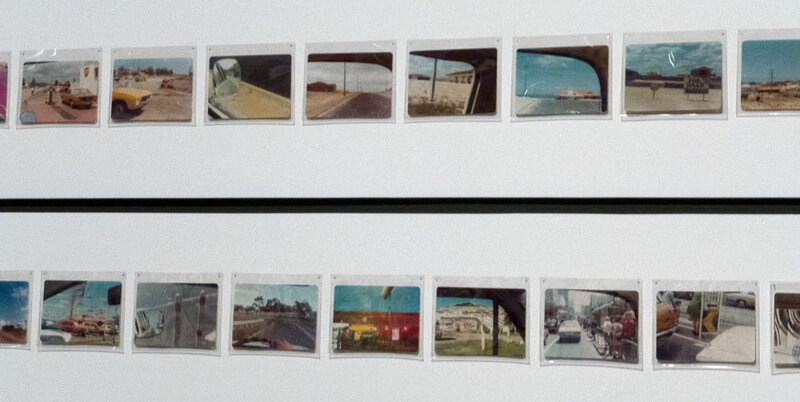 Using a range of strategies – from Instamatic cameras and chemist-shop printing, to expansive composite panoramas and photographic grids that replicate the experience of the modern city – these photographers helped to make sense of the particular experience of movement and landscape made possible by faster cars and better roads, in a way only photography could. The exhibition features some of the most significant photographic projects produced by Australian photographers during this period. Wes Stacey’s mythic series of over 300 photographs The road presents an epic travelogue of road trips made by the artist in his Kombi Van during 1973 and 1974. The exhibition also features John Gollings’s monumental, ten-metre long streetscapes of Surfers Paradise Boulevard from 1973, as well as Robert Rooney’s iconic Holden park, featuring the artist’s Holden car parked in 20 different locations across Melbourne. The road also features work by two of Australia’s most important feminist photographers, Micky Allan and Virginia Coventry, who both challenged many of the gendered assumptions about the road, automotive travel and Australian life during the ‘70s and ‘80s. Gallery Director Shaune Lakin stated, ‘The history of MGA – with its genesis in the late 1970s – is intricately linked to The road, one of our most important exhibitions of the year. Relatively cheap and accessible petrol, increased private car ownership, and a vastly improved network of roads encouraged the suburban expansion of Melbourne, and MGA is one of the many legacies of this expansion. Full marks to the curators at the MCA. This was an exciting exhibition for me as it gave me the opportunity to see some works together from an era in photography that influenced much of my own work. It was also an exhibition for anyone younger as it would have pointed back to an age when cars and travel were a new and cheaper part of life. The exhibition was very much about dealing with urban areas, with the road and people. It was a fun exhibition. Hopefully one day someone could host this exhibition again elsewhere.